I am delighted to bring you the December issue of Drawing Matters. You are receiving this email because you subscribed at Learn to Draw Right or have asked to be added to our mailing list - I never send unsolicited emails. If you no longer wish to receive updates on courses or this newsletter you can unsubscribe by scrolling down to the bottom of this email. The course below is a non-residential workshop in London. In the future I am planning to run residential courses in locations around the UK. Would you like to learn to draw in 2008? If you've always wanted to learn to draw, Drawing on the Right Side of the Brain is a proven technique for teaching drawing - particularly to those people who swear they could never be taught to draw! If you want to learn the five basic skills needed for realistic drawing you can do it a five-day intensive course. We are now taking registrations for the next course. The Drawing Portfolio (RRP £50). All the materials you will need for the course, including drawing tools unique to Drawing on the Right Side of the Brain. If you are still sceptical that you will really learn the basic skills of drawing in just five days, here are some drawings by three different participants. None of them had any significant previous drawing experience or teaching. 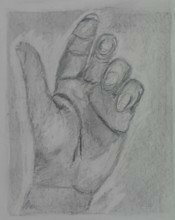 The first "proper" drawing students do is drawing their own hand. 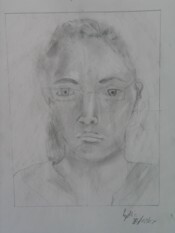 This challenging foreshortened view was completed on the 2nd day of instruction. 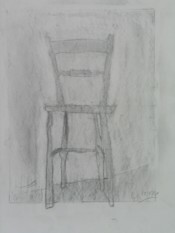 This drawing of a chair was done on the 2nd day of instruction. This sighting drawing was done on the 3rd day of instruction. In case you haven't noticed, Christmas is coming. Contributing to the cost of a drawing course is a great way for family and friends to support your drawing - and help you learn a skill for life. Gift vouchers are available in amounts of £25, £50 and £100 and can be redeemed in full or as part payment on Drawing on the Right Side of the Brain courses offered by Anna Black only. This is where I tell about one of my favourite books - so if you like the sound of it, Christmas is coming! 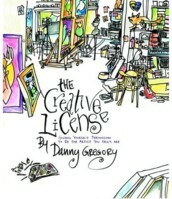 The Creative License by Danny Gregory is a fun book – oozing colour and creativity, the hand-written type giving it a personal, journal-like feel. I defy anyone not to pick up a pen and start drawing after you’ve read this book! This book is not about creating meticulous pencil drawings – it’s about capturing the colour and life of everyday life. It’s about seizing the moment – each moment and drawing drawing drawing… drawing in cafes, at train stations, in your lunch hour, in the doctor’s surgery… Just drawing and capturing your life and others. Great fun, inspiring and highly recommended. It can be hard finding the time to get to an art gallery or museum and too often, when we do, we don’t get to see what we want. Drawings in particular, are often not on permanent view. However, many collections allow online which is a chance to see close up how artists before you have handled different genres and different media.